The Occupy movement and the psychologist are they hand in hand? For some this may not be a far off connection, for others there is very little notion that their work as a therapist could be a part of this movement. It should not be such a remote concept since physicians have set up their own links to the Occupy movement and have long been connected to social change as well. I have managed to connect myself with a number of Facebook groups created by activist psychologists on behalf of their vision for social change through the practice of psychology. Even though the movement itself is still in its infancy and the beauty of it as well as the challenge is that the movement is simply a movement without a clear leader or “list of demands”. It is not necessarily just about generating a list or an agenda of action steps. The movement is about opening the space for people to finally sound out about the increasing gaps not only in income but in overall well-being in this country. The economic gap does have an impact on the health and well-being of everyone. Money pays for health care. In 2010 49.9 million people were without health insurance because they are either unable to pay and/or do not receive health insurance through their employer. Stress has an impact on one’s physical and mental health. With this information that has long been published in numerous journals and in mainstream news outlets, it should be of no surprise that physicians and psychologists have stepped in to join the occupy movements across the country. Doctors and medical students have stepped forward in support of the OWS. Psychologists have come forward in their own ways to discuss and advance an occupy movement of their own. Whether through individual or organizational statements of support, therapists, psychologists and psychiatrists are finding ways to take discussion into action. A radical mental health project is to support the well-being of protesters and occupiers across the country. Those who work for the physical, mental and spiritual well-being of others have stepped forward in support a call for a major social transformation, one that at least helps to insure that people will benefit in a way to bring them health and happiness. There is a link between health and happiness and social and economic justice. Despite the perceived distance between the occupy movement and the therapists chair, there is a link between the two. The work of fighting against injustice and providing psychotherapeutic care are not incongruent concepts. Therapists are in a position that could be far more beneficial to social change than what may be assumed. Clients from the majority of the population that seek out therapy are coming in with concerns that may seem removed from the large context of society. Let’s think about this in regards to the Occupy movement and the financial crisis. An individual’s well-being is tied to multiple factors. This includes their physical, emotional and even spiritual health. Physically, the economic crisis put millions out of work. As a result many lost their jobs and their health care. Those that still had their jobs were stacked with increase work and worry of job loss. People are stressed by debt with less income. Many people may feel isolated in their struggles to keep their homes. Others may be mourning the death of dream or a life that they had worked so hard to obtain. A client may feel a diminished sense of personal freedom when they have lost nearly everything, and so many people have in wake of the economic crisis. Like it or not, psychologists are in a position to help clients deal with the givens of life that are amplified by a sick economy and ultimately an imbalance in economic power in the U.S. The world that is outside the therapy walls are brought in the room with the client. This is why it was of no surprise to me to see mental health workers stepping in deep into the movement. Many of them know from their own professional experience the toll the economic crisis has brought on to their clients, their families and their communities. 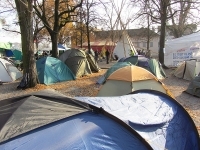 I believe that a vision of Occupy being more than about the tent camps is true. Fundamental questions about how we live in the country, what kind of country do we want to give our children and what opportunities we have to succeed are at hand. These ask all of us to deal with our personal pains and joys on the path of creating a better life for ourselves. Therapists may have the opportunity to work with a client who is exploring the same questions that the Occupy movement is asking but on a larger scale. That is the beauty of the movement, there is a potential for change on a national level as well as on an individual level.